Having faced two relegation strugglers recently, MK Dons will take on another on Saturday when they play Yeovil at Stadium MK. Dons took three points away at Macclesfield Town before a shock defeat in Morecambe - a game Paul Tisdale described as a ‘farce’ - as they put themselves firmly back in contention for automatic promotion. The Glovers head to Milton Keynes sitting 22nd in the table, just three points above Macclesfield, having picked up just six points from a possible 33. "I think they will look at every game in isolation, come up with a plan and look at our strengths and weaknesses," said Dons boss Paul Tisdale. "We always look first at how they think, and then try to get a starting point of what we should be wary of. "They are fighting for survival, so there's a level of stress about that, but we're at the top end of the table, so, to many, they have nothing to lose in this game. I remember they went to Coventry last season and scored five or six. They're one of those teams that can pull a rabbit from a hat. "We treat every opponent with respect, we start with that. They are fighting, Darren Way is capable of pulling that rabbit from the hat, but we hope it leaves that for next week." 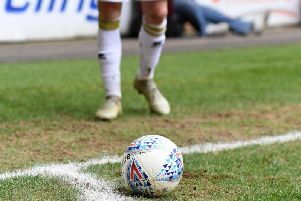 It will be Yeovil’s first visit to Milton Keynes since an infamous day in May 2015 - the day Dons were 5-1 winners and secured promotion to the Championship. Captain Dean Lewington, who scored twice in that game added: "We've all been in situations where we're at the wrong end of the table, so on paper it looks one way. But for 85 per cent of games, you're equal with these teams, you might miss a chance when they score. "Are the team that bad? No, they just might not be clinical. They might have their best game of the season. We have to prepare ourselves for that." Down the years though, there is little to separate the sides, with Dons claiming six wins, Yeovil five and five draws. When the sides met earlier this season Olufela Olomola netted in the 88th minute, cancelling out Kieran Agard’s goal, in a 1-1 draw at Huish Park.